Produced in a facility that processes other nuts. Storage Condition: Cool & dry place. Ingredients: Peanut (34%), Sesame, Sugar, Maltose, Salt. 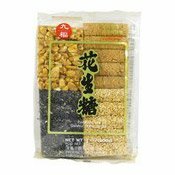 Simply enter your details below and we will send you an e-mail when “Mixed Peanut & Sesame Brittles (九福四式花生糖)” is back in stock!